Having a website used to be luxury a few could afford a decade back. But today, a website has become a necessity for any business, small or large. Websites create an excellent platform for the company to build a digital footprint, and communicate with the target audience. In 2018, we have seen a considerable rise in simple and effective websites which did not require top-grade and complicated development coding processes. This had been made possible with website builders. Website builders have made the task of website development affordable and relatively easier. All you need is an eye for design, a computer system, operating system such as Mozilla Firefox, Google Chrome, Safari, etc and an internet connection, and you may be able to create a good website even free! While this may seem a great deal especially for small businesses or startups, there are certain aspects where website builders fall short. In simple words, website builders are tools or plugin which help in building a website. These tools are comprehensive and include all necessary to create a website without any coding or site design. Today, website builders not only help you set up attractive and affordable websites which are mobile responsive from the start. You can integrate these websites with social media and e-commerce tools. The sites can be easily updated with time to stay current and secure. Wix offers some great templates to get you started. With unique features such as a minified version of the website where you can preview how the various themes, titles, images and other elements of website design appear. An excellent option for e-commerce stores, Wix also provides a great platform to build websites for paid memberships, classes, bookings, paid registrations, etc. The easy to use interface allows even non-experienced users to customize and set up a website quickly. Wix has remarkable customer support as well where users can send their queries which are addressed within a few hours. With an array of well-designed themes to choose from, Wix is a real powerhouse with some great potential ready to be unleashed. Mozello, unlike other similar tools available, is a website builder which allows a user to create multilingual websites for free. This can be a great bonus for businesses with a widespread audience. Although it offers a variety of great features such as a blog, online store, and SEO, adding some aspects of a web page design such as Gallery comes with some limitations. When you create a website with Mozello, a small advertisement is displayed in the footer which often goes unnoticed by visitors. 500 Mb of free storage is included making the entire package quite enticing. WordPress is an open source platform which was intended for blogs but has revolutionalized website development today. With a plethora of free plugins and themes available for WordPress, it has become a popular choice amongst small business looking to get started and build a good brand identity. You can create your website or add a plugin or tool to a current WordPress website which offers visual editing, toggle or drag and drop editing. Although WordPress.com offers a free plan, the premium plan allows the user to monetize the site, a lucrative way of capitalizing your website. With paid plans starting at $96/year, the user also gains access to even more themes and customization features. Squarespace has swiftly made its place in the field of website development field, a feat backed by their podcast and YouTube marketing. While using a website builder, beginners might be enticed with having abundant options and features, but as you start building your website, it can actually lead to confusion and decision fatigue. This is where Squarespace wins the bout. The entire process is streamlined, and once you have finalized a theme, you click on a particular box and it offers a set of customizations to choose from. With Squarespace, you can build a conventional website at a price of $144 peryear and an online store for $312 per year. Divi is a great website builder plugin for creating modular WordPress websites. You can install the plugin with an existing WordPress setup or start again. Instead of editing an HTML file or Code, Divi provides a smooth drag and drop visual editor. This offers greater control over the design for the user. You can create the entire web page design and add essential elements such as text, sliders, forms, images, videos, etc. Divi also allows various custom effects such as shadow, hover, etc. are enhancing the entire user experience. A single Divi website license costs for $89/year and a lifetime license for unlimited WordPress websites it costs at $249. GoDaddy is known for its hosting and domain services, but the company also offers its very own website builder. The user can choose from a variety of pre-made templates which are categorized based on the purpose of the website. The tool completely supports e-commerce website as well as a scheduling setup. The key feature with GoDaddy is that it offers one month of free trial. During this period you can check out all the features of the tool and hire a logo designer to create some great logos if you are just starting. Many business owners are on a lookout of heavy and extensive websites from day one. Building a site which has it all takes time. As you are setting up your business, you can choose their free plan and set up a single page website to start creating your digital footprint. Combined with their premade themes and some great graphic design ideas, you can start spreading the word amongst your targetted audience before the grand opening. The tool offers an iOS as well as Android Mobile app for editing the website on the go, something you rarely find with a website builder. Unlike most of the website builders, Webflow has been created keeping in mind developers and designers. Signing up on the tool is an easy process and adding credit card information is not mandatory. The user benefits from the tones of fun and comprehensive tutorials on how to better use the tool. The user interface may prove difficult for amateurs to get used to and the blank theme may seem unattractive. But the tool packs a punch for the professionals and may end up being a staple for website designers just like Photoshop is for any graphic designer. BoldGrid is one of the visual builders which allow the user to preview a web page as it would appear to a visitor. You can click on a section you wish to edit and build the website according to your preferences. BoldGrid website builder can also be used with an already setup WordPress website. The tool uses the CMS (Content Management System) part of the WordPress Setup. Any user can use this builder with or without any past designing and development skills. 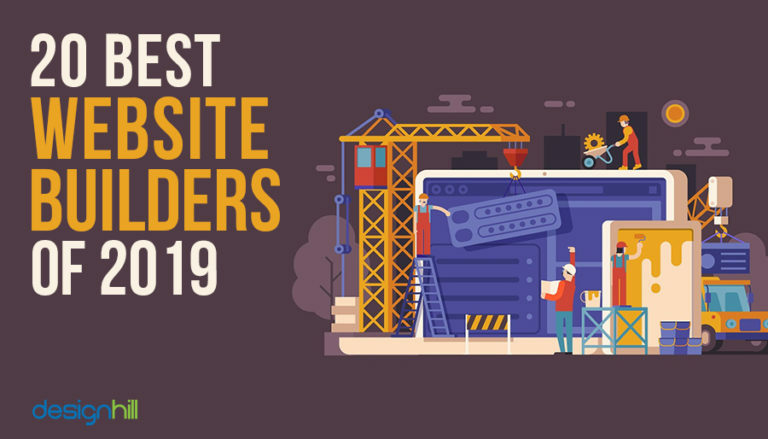 With over 200,000 users and 1200 template designs to choose from, SiteBuilder is no doubt one of the top contenders for building a good website design in 2019. Just as AI-based graphics tools have made it possible for beginners to create a logo, Website builders such as SiteBuilder, allow users in creating enticing websites using the drag and drop features. The tool rightly boasts of a near-flawless uptime for the website which is a cherry on the top. Not only is the website design adding to great user experience, but it is also affordable, and you won’t have to compromise on performance. Site123 offers a unique approach to website building. The tool tackles each part of the website individually, and there are different sets of choices for each piece. This provides users with an option to either maintain consistency or harmony of design on the page, or they can add an element that breaks the monotony of a clean and simple design. Site123 can achieve something which is elusive from most of the website builders, and that is a balance. The tool is designed in such a way that the tool does some of your work for you and lets you make customized edits to the design as well. If you are looking to set up an online store, then Volusion can be an excellent choice for you. Volusion offers 11 premade themes to choose from as part of their free plan and themes from their premium library can be used for an added fee. Browse through all the themes and pick the one which matches your company’s style and color. This would ensure that your brand personality showcased by the website is in sync with your social media page design. Volusion is great for small business owners as it can work with 35 different payment processing gateways. Although most of the layouts offered by Volusion are mobile-friendly, some, however, may not be mobile responsive. Hence, it is crucial to check demos and test how it would appear on various screens. If your main aim is to set up a good website without extensive customization and alterations, Jimdo should be your choice. Although there are limited layout options, they are extensively designed keeping in mind various organizations the website may be intended for. The user can make minimal edits, but this makes the entire process simplified as it eliminates the overabundant options that result in decision fatigue. Most of the online graphic design services tools offer customization of colours, texts, and images by the user. But Jimdo allows for only some changes such as adding a new heading, add text, insert photos or videos, etc. Using Weebly, you can create as many pages of your website as you wish. SEO settings and optimization can be made for each page making it an excellent option for new businesses looking to create exposure with an affordable website. The free plan for Weebly does not have much to offer, but as you purchase the paid plan, the apparent advertisement which comes with the free plan can be removed. Ukit is one of the most popular website builders for setting up an e-commerce website. With the commercial plan, you can add the shopping cart and checkout features. Ukit offers not one but two distinctive features which make the entire website building process more comfortable for the user. One of these features is the “Adaptive Site View” using which you can check the responsiveness of the design for mobile and tablet. The other unique feature which sweetens the deal is the “Promotion Readiness.” Once you have finished editing the pages, the tool analyses the pages and prompts users if anything is amiss and needs attention before going live. Duda is deemed as one of the responsive site builders and rightly so. It creates websites which are mobile ready and are therefore easily readable on mobile devices. The tools offer many layouts which are divided based on various categories such as one-page sites, restaurants, places promoting events, travel sites and more. With its drag and drop visual editor, even the inexperienced user can create a good website easily. Shopify, as the name suggests, focuses on building shopping or ecommerce websites. Unlike most of the traditional sites, these require certain essential features such as shopping carts, user accounts, shopping filters, inventory systems, and payment processing—to name a few. Although Shopify does not offer drag-and-drop editor, it, however, provides a visual representation or preview of the site where you can check the progress as you make the changes. Some of the key features the builder also provides which are beneficial for an e-commerce platform include cart recovery service, fraud analysis services, etc. Webnode offers stylish, modern and responsive theme layouts. All you need is to choose the theme that suits your style and add your finishing touches to make it your own. The low-cost plan for Webnode called the Limited is true to its name and offers only some limited features. This plan costs about $3.95 per month and allows you to keep using a domain name that you already own and access to their premium support. Webstarts offers a reasonably flexible editor so that the user can move elements of the web page freely. The essential features such Blog and online store can be added with the tool. One of the significant drawbacks holding the tool back is the limited themes available for the user, and although these layouts are smartphone friendly, they are not always responsive on all different screens. UCraft is one of the handful website builders which allow you to connect a proper domain name free of charge. The tool offers a decent layout collection for the user to choose from, but the free plan restricts it to one page. You can upgrade your plan to the purchased account for access to all the features this tool has to offer. There is a learning curve associated with the user interface for the tool, but once the user gets accustomed, they can fine-tune the styles such as fonts, colours, alignments, and spacings. While some of the website builders are free, some charge a one time or subscription fee. Each of these tools or plugins has something different to offer following the current website trends, and hence it makes choosing the best builder a difficult task. As you look for the perfect website builder for your website in 2019, consider the costs as well as the ease of use. And while you are zeroing in on the best choice for you, make sure to factor in the upgrades and security updates that are critical for a secure website in the long run. As getting your website designed by an agency is an expensive affair, you can get it done by launching a website design contest at Designhill where developers from around the world will submit dozens of entries to choose from.